The Anatomical Theatre was commissioned in 1825 to provide University of Virginia students with the opportunity to learn about and practice surgery. Thomas Jefferson designed the building after finishing his plans for his “academical village,” although he did not do so alone; it is likely that Benjamin Henry Latrobe, Jefferson’s friend and fellow architect, as well as Robley Dunglison, the newly-hired professor of medicine, contributed to the design. The Anatomical Theatre was demolished in 1939 to create space for Alderman Library, but its story can teach us about Jefferson’s views on education, the history of the medical school, and the lives of the students at the early University. Although Jefferson knew that the study of medicine would be an important part of the University of Virginia, he placed a special emphasis on the practical aspects of study. Anatomy and surgery would be the focus at his school, while quickly outdated medical theories would be downplayed. Speaking specifically about the University, he stressed the vital significance of a hospital “where the students can have the benefits of attending clinical lectures, and of assisting at operations of surgery” (1818). Medical education in the United Sates at this time was just beginning to develop, and when Jefferson hired Mr. Dunglison to serve as the full-time professor of medicine, he was the first such professor in the country (Magazine, 2008). Dunglison would serve in another capacity, as Jefferson’s personal physician during the last years of his life. Letters passing between the two show Dunglison’s attentiveness to Jefferson’s deteriorating health as well as his polite dissatisfaction with the facilities with which he had been provided to teach medicine (Dorsey, 1960). When Jefferson designed the original University, he dispersed ten pavilions over a grassy rectangle – the Lawn. Each pavilion housed a professor on the upper floor and contained a classroom on the lower floor. The pavilions, as Dunglison remarked in his autobiography, were beautiful structures, but it was clear that Jefferson had been “planning the architectural exterior first, and leaving the interior to shift for itself” (Dunglison, 1852). He mentions a lack of closets (since they would have ruined the symmetry that Jefferson prized) as well as a need for a distinct building for anatomical study. Dunglison’s pavilion was a fitting lecture hall, but it could not meet his needs for the practical study that Jefferson thought vital; without what Dunglison calls the “clinical advantages” of practice, medical training was impossible (Dunglison, 1852). A way to demonstrate and practice surgery was needed in order to complete the medical training provided by the University. Indeed, this was at first how the Board of Visitors expected the subject to be taught: students would receive enough medical knowledge to provide them with a suitable background to cultivate experience elsewhere. A somewhat snide remark from the then-President of the College of William and Mary points out this deficiency: “it is as impossible to make doctors at the University of Virginia as it is to have ships without sails or waves” (Rodgers, 1930). As a result, many young men began their study of medicine at U.Va. but later moved on to other universities, like the one being developed in Richmond. Jefferson, whose disposition against medical theory and towards medical practice made him receptive to Dunglison’s call for a new building for Anatomy, began the design of the structure that would come to be known as the Anatomical Theatre. Like much of the Lawn’s architecture, Jefferson would pull from personal experience and outside assistance in his design process. Dunglison, reflecting on a conversation with Jefferson, says that while Jefferson would choose the “position and architectural arrangements externally,” it would be Dunglison’s job to plan the “interior arrangements” (Dunglison, 1852). And just as Jefferson was inspired by Greek temples and French hotels when designing the academical village, it is likely that he looked to other anatomical theatres to inspire his own. The first anatomical theatres arose during the Renaissance, when the study of the human body first entered university curricula. In a treatise by Vidus Vidius, an Italian surgeon and anatomist, we see instructions on creating such a theatre. Vidius touches on two aspects that would prove significant for Jefferson’s anatomical theatre, the octagonal shape of the amphitheatre and the need for strong lighting. Anatomical theatres of this mold started out as temporary structures, but permanent establishments developed, first in Padua, Italy in 1594 and later in Leyden, Holland in 1597. Over the next two centuries, buildings of this sort began appearing across Europe, and the idea of the anatomical theatre became so prominent as to influence American minds as well (Medical Alumni Association, 2014). The University of Pennsylvania, founded by two doctors who were trained in Europe, was the first school in the United States to construct an anatomical theatre. In 1805, they contacted Benjamin Latrobe to design the building. He responded two days later with his preliminary drawings. Latrobe was a preeminent American architect, who, just two years prior, had been hired by President Thomas Jefferson to serve as the Surveyor of the Public Buildings of the United States (Britannica, 2015). During his time in this position, he supervised the construction of the Capitol Building and designed several major projects in Washington, D.C.
Latrobe corresponded frequently with Jefferson, developing a professional relationship and friendship. Years later, as Jefferson began to design the academical village, he would write to Latrobe for advice. In fact, it was Latrobe who suggested to Jefferson that he distinguish the central building of the original university with a dome (Mattice, 2013). And although much of their correspondence and exchanged drawings are lost, historians theorize that Latrobe influenced the designs of the pavilions as well. For this reason, it is very possible that Jefferson’s design for the Anatomical Theatre would have incorporated feedback and advice from Latrobe, who was one of America’s only professional architects at the time of the University of Virginia’s construction. In 1825, the Board of Visitors approved Jefferson’s design for the Anatomical Theatre, which used elements from Dunglison’s input as well as Latrobe’s design for the University of Pennsylvania theatre. The perfectly square building would be comprised of three stories. The topmost level would be the theatre, which featured tiered seating and was octagonal in shape. The middle story was designated a “museum” on Jefferson’s drawing; it would house exhibits on anatomy until its conversion into a lecture hall. These exhibits included real and model skeletons, dissected cadavers, and dried body parts. The lowest level was the “charnel” where cadavers would be stored and later disposed (IATH, 1995). A 1977 excavation of the site found human bone and ash outside the area where the charnel used to be, confirming this use; such findings are common near medical training facilities from this time period (Cheek, 1977). Construction began in 1826 and finished in 1827. The project reportedly cost “about as much as one of our hotels” – approximately $5,000 (Jefferson, 1825). Adjusted for inflation, this amount is just over $100,000 (Friedman, 1997). In 1826, when the Virginia House of Representatives voted overwhelmingly against funding further University construction, Jefferson himself rode to the site and urged them to use all remaining money to finish the Dome Room of the Rotunda and the Anatomical Theatre. Clearly, the practical training offered by this building was of top priority to Jefferson (Jefferson, 1826). The Anatomical Theatre was opened for use at the start of the third session of classes at the University (Minutes, 1826). Dissections took place in the upper theatre and Professor Dunglison ordered anatomical preparations of body parts and “surgical instruments” to display in the museum on the middle level. In 1832, the Board of Visitors set aside $100 for cadavers and museum supplies (Rogers, 1930). The list of exhibits that Dunglison requested includes dried preparations of the uterus, bladder, and heart as well as an “injected” liver and spleen; drying out or injecting an organ with dyes revealed different structures (Dorsey, 1960). In addition, a male and a female skeleton were requested. While some of these were models, most anatomical preparations at this time were dissected body parts that were arranged for display. Many of these exhibits had to be shipped from overseas, reinforcing the lack of medical education and technology in the United States during the early years of the University. Even after the building went into use, construction in and around the Anatomical Theatre continued. In 1830, the rooms were repurposed to allow for both a “dissecting room” and a “lecture room” – it is unclear which of these occupied the third story theatre space (Minutes, 1830). In 1831, the “kitchen garden contiguous to the Anatomical Theatre” was removed, likely to make room for an additional building for storing cadavers in order to create more room in the Theatre itself; this one-story brick building was called “Stiff Hall” among the student body, but it was formally referred to as the “Anatomical Laboratory” (Fitz-Hugh, 1981). In 1835, further modifications were approved by the Board of Visitors to better heat the space, adding a “temporary partition” for the winter months and placing an additional stove in the building. Keeping the building warm was a common issue, and is referenced yet again in the 1840 Board of Visitors minutes. In the first decades of the Anatomical Theatre’s existence, it was used not only for surgical demonstration and practice but also for the Professor of Medicine to hold hours “for the purpose of dispending medical advice, vaccination, and aid in surgical cases” (Enactments, 1827). The duty of finding subjects for dissection also fell to this professor. The purchasing of cadavers was a lengthy process, so in perhaps the most shocking of stories about the Anatomical Theatre, students were instructed by professors on what were called “anatomical expeditions” to dig up freshly buried bodies from local gravesites (Rogers, 1830). The practice was not only illegal but dangerous as well: a student reportedly incurred a gunshot wound when nearly apprehended for this practice. Unfortunately and unsurprisingly, many of the corpses used were those of enslaved laborers under the employ of the school. This further complicates the record of those who served the early University; efforts to research and memorialize these enslaved people are underway. One man, simply referred to as “Lewis” in the school’s bookkeeping, is one of the few enslaved laborers who we know to be assigned to work in the Anatomical Theatre and Laboratory. During his tenure, students gave him the derogatory nickname “Anatomical Lewis.” Lewis, like many of the other enslaved laborers (and later, free blacks) who served as undertakers and janitors in these buildings, was “ostracized” by the rest of the black community due to the nature of his work (Fitz-Hugh, 1981). Lewis lived in different locations during his time at the University, including behind Pavilion VII. We know that “by 1860, Lewis no longer appears in University records” but we are unsure as to whether he left as a result of death or was sold (IDEA, 2013). Lewis is one of the few enslaved laborers whose name and role is preserved from the nineteenth century at the University. In 1889, a fire caused damages worth $1,500 to the Theatre and destroyed anatomical models contained within (Minutes, 1889). The cause of the fire is unknown or at least remains unnoted. In 1902, the Board of Visitors commissioned a “cold storage plant” for use by the “Anatomical Department;” this addition was likely for the storage of cadavers, although it is unclear whether or not this was built onto the Theatre itself (Minutes, 1902). The Anatomical Theatre saw continued use as the University’s medical programs expanded and required more space. However, after the building was condemned in 1924, it was restored to house the “now-defunct School of Rural Economics” (Magazine, 2008). Five years later, in 1929, the building was demolished as part of the Alderman Library construction project. The Anatomical Theatre was built on a steep slope that descended from east to west, away from present-day McCormick Road. The ground was leveled after the building’s demolition, but archeological evidence suggests that the present area is 20 feet above the original elevation of the west side. The demolition process left very little of the structure underground, but the aforementioned excavation project revealed that remnants of the eastern wall remain under McCormick Road (Cheek, 1977). Many of the bricks from the Anatomical Theatre were used to rebuild the serpentine walls that enclose the pavilion gardens. The history of the Anatomical Theatre, from its conception to its changing structure and uses, reveals a unique story of the early years of the University. 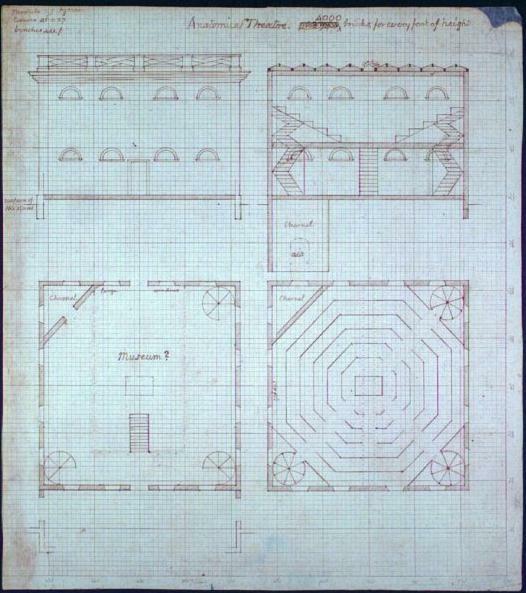 Jefferson’s correspondence with Robley Dunglison, his newly-hired Professor of Medicine, exposes the planning process for the building. It also highlights Jefferson’s views on medical education and the need for practical experience in creating physicians. The design for the structure, pulling inspiration from European anatomical theatres as well as input from Dunglison and potential communication with Henry Latrobe, reinforces this desire for experiential learning. The use of the space for dissections, as a museum of anatomical preparations, as a storage area for cadavers, and as a doctor’s office, shows the needs of the school as well as the state of medical education in the United States. In addition, the Theatre intersects with the University’s legacy with slavery, showing the demeaning and damaging roles that enslaved people faced in Jefferson’s academical village. Though now demolished, the Anatomical Theatre left a tangible impact on the early University, providing the rare benefit of medical training for students at a time when such education was nearly nonexistent in the United States. Brandt, Lydia Mattice. "The Architecture of the University of Virginia." Encyclopedia Virginia. Virginia Foundation for the Humanities, 2013. Cheek, Charles D. “Archeological investigations at the site of the Anatomical Theatre,” 1977. Dunglison, Robley. The Autobiographical Ana of Robley Dunglison, M.D. Edited by Samuel X. Radbill. Philadelphia: American Philosophical Society, 1963. Fitz-Hugh, G. Slaughter. Anatomical Laboratory – Dissecting Hall 1833-1928, 1981. Friedman, Morgan. The Inflation Calculator, 1997. Jefferson, Thomas. Letter to Doctor Crawford, 1812. Jefferson, Thomas. Letter to James Madison, February 17, 1826. Jefferson, Thomas. Letter to Joseph Cabell, January 11, 1825. Jefferson, Thomas. Report to the Commissioners of the University of Virginia, 1818. Rogers, Elise Anderson. The Foundation and Early History of the Medical School at the University of Virginia (to 1840), 1930. “1825-1939: The Anatomical Theater.” UVA Magazine, 2008. Anatomical Theatre 3D Model. University of Virginia Library System. Anatomical Theatre Drawings. Institute for Advanced Technology in the Humanities (IATH), University of Virginia, 1995. “Benjamin Latrobe.” Encyclopedia Britannica, 2015. “Board of Visitors Minutes,” University of Virginia Library System. “Early Anatomical Theaters.” Medical Alumni Association, 2014. “Enactments by the Rector and Visitors of the University of Virginia for Constituting, Governing & Conducting that Institution.” JUEL, 1827. The Jefferson-Dunglison Letters. Edited by John M. Dorsey. Charlottesville: University Press of Virginia, 1960. “Slavery at the University of Virginia.” University of Virginia IDEA Fund, 2013. Puzio, Dominic. "The Anatomical Theatre (1825-1939)." JUEL, June 8, 2015. http://juel.iath.virginia.edu/node/242.